Children's Books that kids will read over and over again. You'll be amazed by what they can do! They say that a child learns to read on the laps of their parents. With both my children I took this very much to heart and read to them, and with them, from the time they were very young. Here are a few books that I discovery that they loved to read over and over. I have given many of these books to friends who are breeding and they say that their children have also loved the books. See what you think of these children's books. Tactile Books (ones they can touch stuff in) are a nice experience for children. This one has fur in it that my daughter loved to run her fingers through. 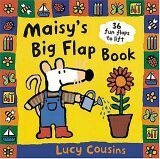 Maisy's Big Flap Book - My sister sent my daughter a collection of Maisy books and they have achieved favourite book status. A great present for the age group. Ahhh, this is such a great interactive book. My daughter loved to open all the flaps and tell you just what was there. Where's Spot? - is a must for all small kids. This is a beautiful pop up book that is full of surprises. Just remember to always read it with your child as with all pop up books it is a bit fragile. 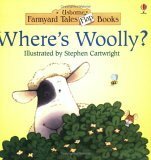 Where's Woolly is another great book to read over and over. Kids never seem to tire of pulling back the flaps to explore what is revealed.